And what it's like to live and make art there as a foreigner. Justine Foord is an artist born and raised in England who found her artistic path in Cuba. As one of the few foreign artists invited to work there and the very first British female artist to show at the museum Fototeca de Cuba, Foord has a unique perspective into a country many Westerners will still never see. Her recent show “Candela” was her first international traveling exhibition, having first opened in Spain and then traveling to Cuba to be featured during a “British Culture Week” hosted by the British embassy in Havana. Her signature method of painting directly on photographs is on full display in this body of work, with gorgeous, moody colorful landscapes partially obscured with surreal clouds of smoke and soot. In her interview below, Foord explains her personal (and romantic) connection to the Cuban landscape, and what it was like to mount an exhibition overseas when your artwork didn’t make it past customs. You can also find out more about Justine Foord and work through her studio Masque Media. What were the circumstances that led you to Cuba?I was always drawn to the mystery of Cuba, bravely existing for years and preserved from the passing of time. I felt an immediate spiritual connection, and found the beauty of the land very inspiring. I call it an artist’s paradise. I was able to return, and gradually integrate myself with the warm-hearted and supportive community of people after falling in love with a Cuban man. He helped me establish a deep and soulful relationship with the island. As one of the few foreign artists invited to work in the country, please tell us about your years spent in Cuba. It’s been an honor to be recognized as the first solo British female artist to show at Fototeca de Cuba museum in the modern era. Even more so, to be able to connect to the spirit of the Cuban people. With this exhibit, my dream to return the art back home to its birthplace was fulfilled. Like in Paulo Coelho’s The Alchemist, this work, for me, is the outcome of following my destiny. Cubans are island people with strong hearts and strong humor. I feel a connection to their character from also having grown up on a small island. Like British people, they also have strong hearts and a strong sense of humor. During my years in Cuba with him, we traveled together visiting many different Provinces, and I experienced living the real culture. I so enjoyed the organic Cuban food, divine love, the music, the dance, the cars, the landscapes, celebrating birthdays with family while roasting a whole pig, and much more than I can express in words. This shared time with him was like a force stronger than Mother Nature. Whatever came between us, it could not destroy the connection. I would then have to walk away; the sun would go down, I would return home to England to digitally paint on my photographs—it was the shade to cope with being absent from Cuba and away from him. I am a spiritual person, and this suffering and fury conceived my pictures. Our connection is a deeper force. A power beyond my control. Many years later, we can be together in Cuba, sharing with friends and family our visual journey. I was humbled to be invited back to Havana by the UK Ambassador to participate in British week this past October 7. 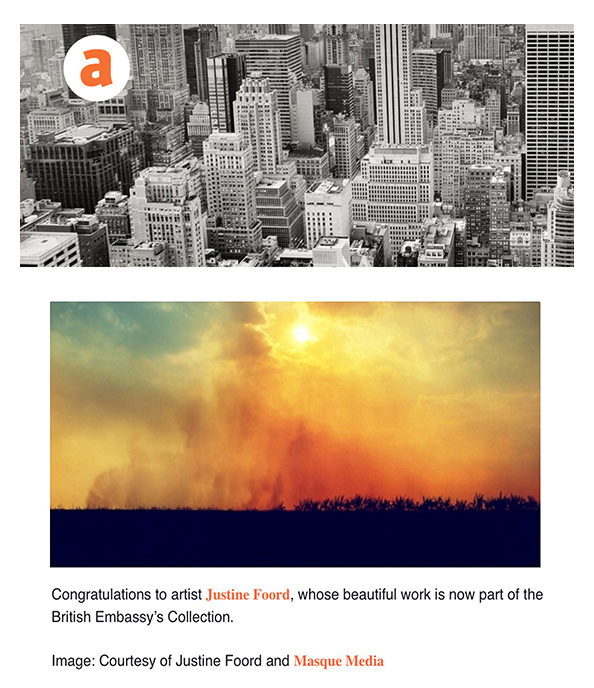 It’s a great celebration to represent Britain in art. What is your opinion of the art market in Cuba? Do you see potential for growth? I feel very fortunate to have received the support from Fototeca and both UK and US embassies over this exhibition, but I do realize that local artists are facing a changing and challenging climate. I think there is still a lot of room for discussion and growth about what it means to sustain oneself as an artist living in Cuba. This year we witnessed the 12th undertaking of the Havana Biennale. It is the first since the thaw in Cuban-US relations. Travelling is one of my passions. In the UK, we have a saying: “Procrastination is the thief of time.” I’ve held onto these words since childhood. I like to keep moving in life; it is a privilege. Through my travelling I have learned about people and culture. “Candela” at Fototeca certainly is a discovery both personally and professionally; it has been one of the most memorable moments in my life. Art can be born through suffering. It’s now my enjoyment to be able to connect and express my adventures artistically. Presently, I’m working on a body of work that I have been building for over seven years. It ran parallel in the background with “Candela”—I like to work on more than one project at a time. It is titled “THE RESURRECTION OF SUPERMODEL RIPPED #phoenixEdition” and it is a very different style from “Candela.” It’s a usage of mixed-media and acrylic paint. This work survived a very tragic moment of my life: a house fire in which I lost many pieces, and only fifteen survived. All I can say for now is that I’m currently working on rebuilding the collection, so sit tight. From rebirth I am now experiencing growth, previously having only exhibited in group shows to now exhibiting as an international solo female artist at museums and galleries. Like for Cubans with the idea of rebirth with a positive end, they always look to hope towards the extending flames. Many Cubans flee from Cuba searching for a new life and cannot return to their family and loved ones, a choice they make to seek a brighter future—that’s real pain. Thankfully, now many Cubans being reunited with their families. On a personal note, I chose this past year to look inward and connect deeper to my inner voice, working on a personal challenging level and coming to a profound understanding. By channeling this energy and facing the suffering it creates openings and enlightenment, space for elevation and for miracles to transcend. In the production of “Candela” we faced some real challenges in shipping the prints to Cuba. We could not get them in. So the beautiful and miraculous outcome was finding local printers to work with my digital files, and framers to put up our show with the very limited resources available locally. How do you evaluate success as an artist?